Thank you so much Tracey I am really….REALLY happy with it all!! You have been amazingly patient and I can’t praise your work highly enough. You are absolutely brilliant at what you do. The final product is beyond my expectations. I will be recommending you to everyone who needs a website. I apologise for all the extra work that I’ve given you and thank you for being so accommodating to all my changes and indecisions. I have no doubt that the new website will generate more enquiries and bookings. Operating out of Falmouth, Ali Berry Weddings provide the best in wedding planning services throughout the area. Their impeccable sense of style and attention to detail are second to none, and will ensure your big day goes off without a hitch. Regardless of the size of your ceremony, they can bring your dream wedding to life as wonderfully as you and your partner have dreamed it could be. Weddings can be of any size and style, from intimate and romantic for just you and your partner’s close family, to larger celebrations with all of your loved ones. 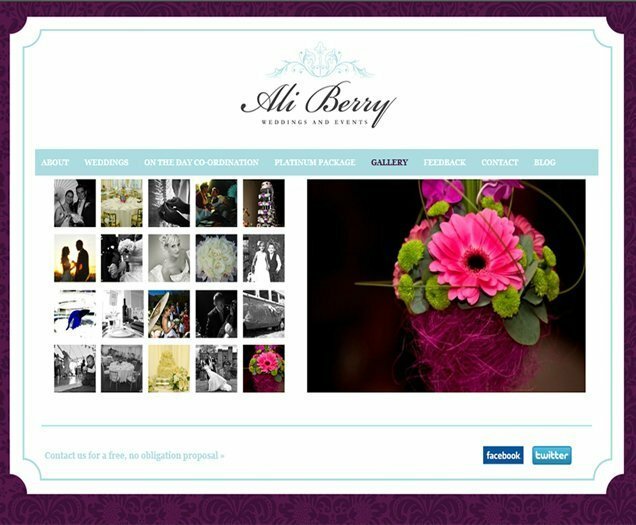 Ali Berry Weddings will remain exactly as involved in the process as you wish and require. I didn’t do the design for this project, back in the day I used to do development only work. This was a standard HTML website but I did build it with a custom database to enable Ali to add news and blog updates as she needed. I think these days there is no need to create a custom CMS but I am glad that I know how if I ever needed to! I enjoy building and developing websites but I also really love the design side, so these days I don’t do any stand alone development work. I only build the websites that I design.